It was an . . .
...itsy bitsy, teenie weenie, yellow polka dot bikini! I thought we'd finish off Desserts for Dudes month by giving the guys a little eye candy cookie. As Mr. E probably has guessed, this is as close to a bikini as I'm getting in this lifetime (or the next). Enjoy, honey. 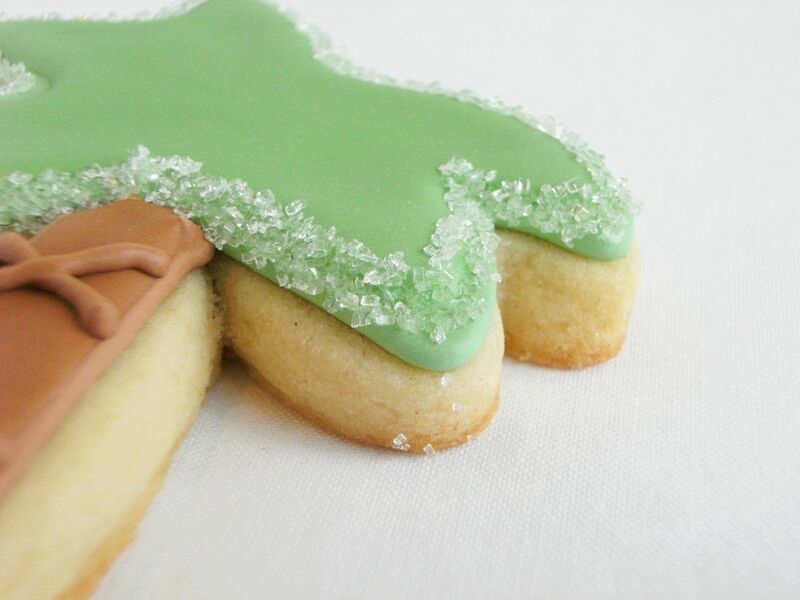 Using #2 tips, outline the branches in green and the trunk in brown royal icing (AmeriColor Avocado and Leaf Green mixed, AmeriColor Chocolate Brown). 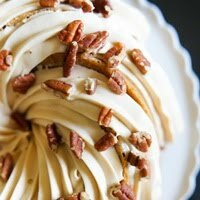 Thin the royal icing with water to the consistency of thick syrup. Cover with a damp dish towel and let sit several minutes. Stir gently with a rubber spatula to break any air bubbles that have risen to the surface. Transfer to squeeze bottles. Fill in the trunk of the tree in brown. Fill in the leaves in green. 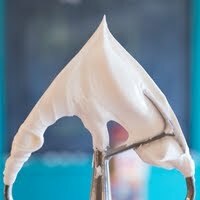 After 1 hour or so, add the details to the truck in piping consistency royal icing, using a #2 tip. Paint the meringue powder/water mixture over the edge of the cookie. 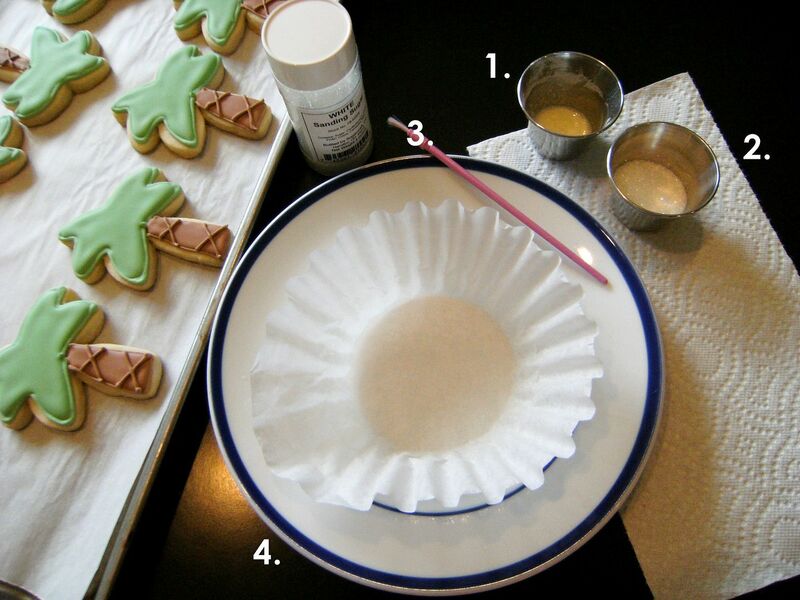 Holding the cookie over the coffee filter, sprinkle on the sanding sugar. Shake off excess onto the filter. Use the filter as a funnel to refill container of sanding sugar. Alrighty...Desserts for Dudes month is officially over. Bring on the pink and sprinkles! 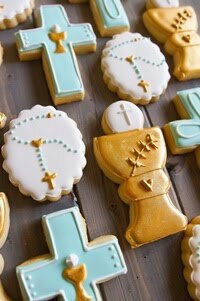 This was such a fun month of posts Bridget and to end it with these *eye candy* cookies for the guys...fantastic! 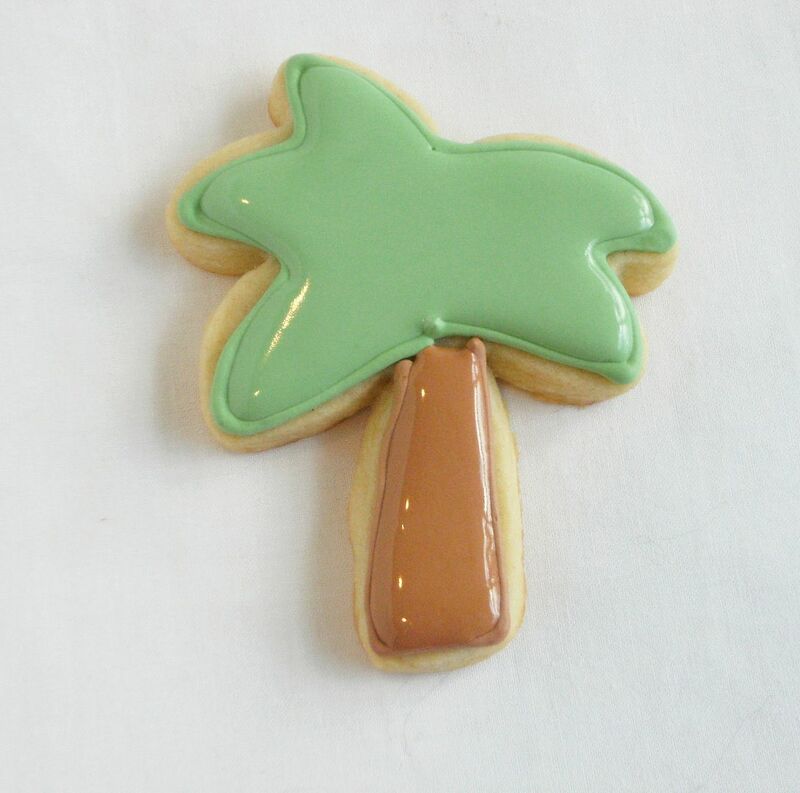 Your bikinis are so cute and I love how you did the palm trees. Looking forward to getting into the *pink* next month. LOL I love that... "bring on the pink and sprinkles!" Yay!!! ANd I LOVE the ruffles. And. Well. Everything. You really did an amazing job girl! I love all the little additions you had, like the bows and sprinkles on the palm trees. Gorgeous. Could they get any cuter?! I think not! And thank you sooo much for sharing your sanding technique...I've been trying to figure out how you guys do that. Yay! I love ALL the desserts for Dudes! Especially the beer and hot dogs!! Can't wait for the pink and sprinkles! Adorable! Love the coffee filter tip. Thanks! Absolutely adorable. Those would be so great for a bridal or lingerie shower, too. ahhhh, to cute!! and I love that you wrapped up the desserts for dudes with yellow bikini cookies! haha!!!! My favourite of the month was definitely the Beer and Hot Dog cookies! 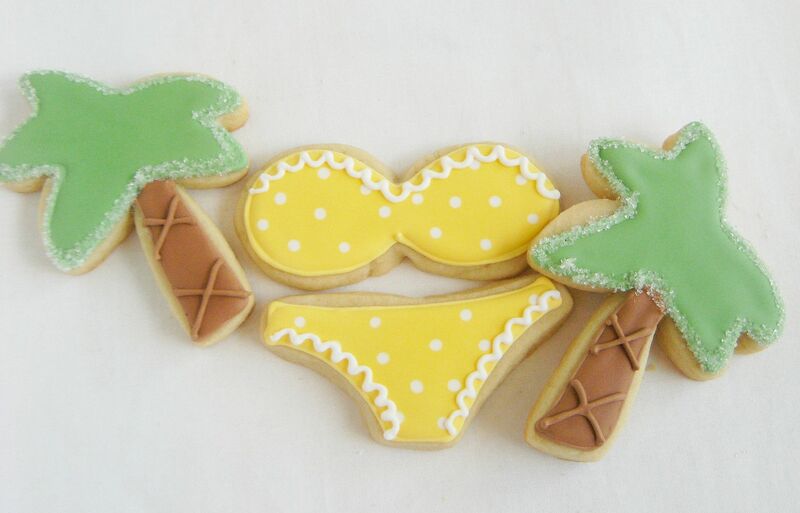 Love these bikini cookies too - so cute! Oh my gosh! These are so awesome! I have loved this month's theme and I hope we get more theme months out of you! Great job and thanks for sharing all your talent with us! 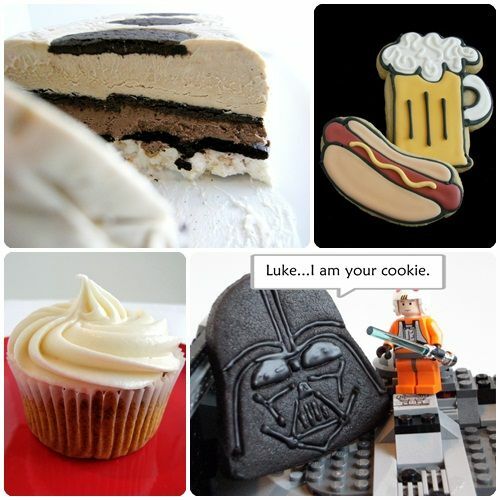 great ending to your clever month of desserts for dudes! Hey I just stumbled upon your blog. Your recipes all looks so yummy. Thanks for sharing! Love that tune and your sweet cookies! Summer wouldn't be the same without singing that song. 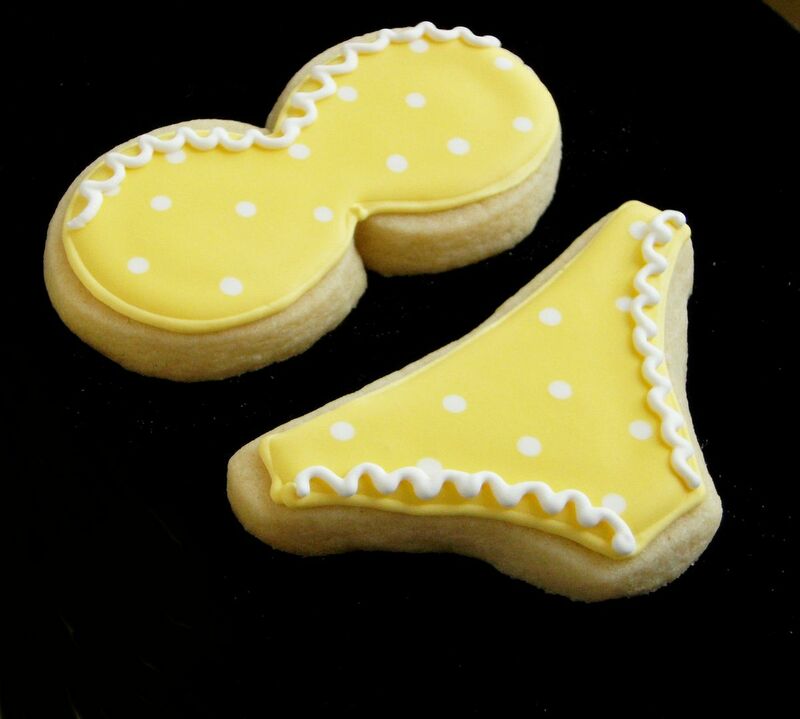 You'd think with all the craze on polka-dots that there would be tons of yellow polka dot bikinis in the stores, but they seem to have all other colors :) I love these bikini cookies they are so wonderful! Those are the cutest things I've ever seen! You've done an amazing job with Desserts for Dudes month, they've all been fantastic! I just got these cutters! I can't wait to use them ~ going to Austin next week to bake more cookies for Dell and they want beach themed cookies...so I bought these cutters and some board shorts. Can't wait to make them...yours turned out adorable! I have really enjoyed your dude cookies this month. Great ideas! Just adorable! You are so creative! So cute! I have REALLY enjoyed your Desert for Dudes during this Father's Day month - what a Super idea! Your cookies are always so fantastic! You inspire me with every crumb, every motion of your pastry bag and decorating tips! What a pro you are! 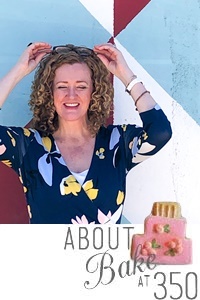 I am so thankful for finding you last year - it's been so much fun baking and decorating cookies and just in one year I've earned just over $900 doing something I'd gladly do for friends for FREE! So thank you, Bridget! I'll forever be your biggest fan! Next to your dudes, of course! Love your 'eye cookies'! I made my dude Orange Pistachio Cake(http://www.heidisfullplate.com/2010/06/orange-pistachio-cake-recipe.html) that he requested and Pecan Pie Muffins (http://www.heidisfullplate.com/2010/06/pecan-pie-mini-muffins-recipe.html that remind us of a fun weekend get a way we took together. Love cooking for my dude. Thanks! how adorable are these!!!! cute! I absolutely LOVE LOVE LOVE these! How perfect for summer! They are so stinkin cute. So cute. I just love all your ideas. That was a fun month and I really looked forward to see what was next. Can't wait to see whats in store for July. Fun project and instruction and very appropriate for the summer. Hahaha! Those are adorable. I've really enjoyed all your desserts for dudes posts! Adorable! 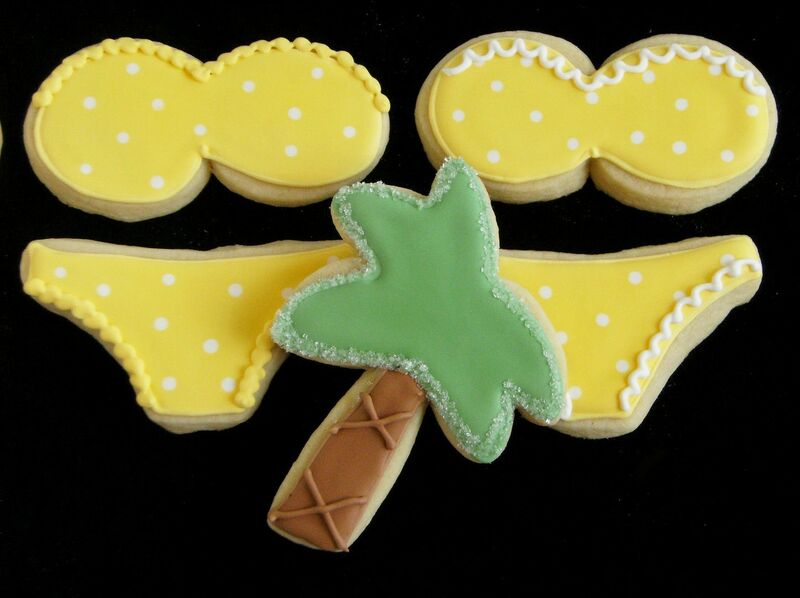 The palm trees made me want to be in Hawaii, but in a yellow polka dot one piece, with a skirt! 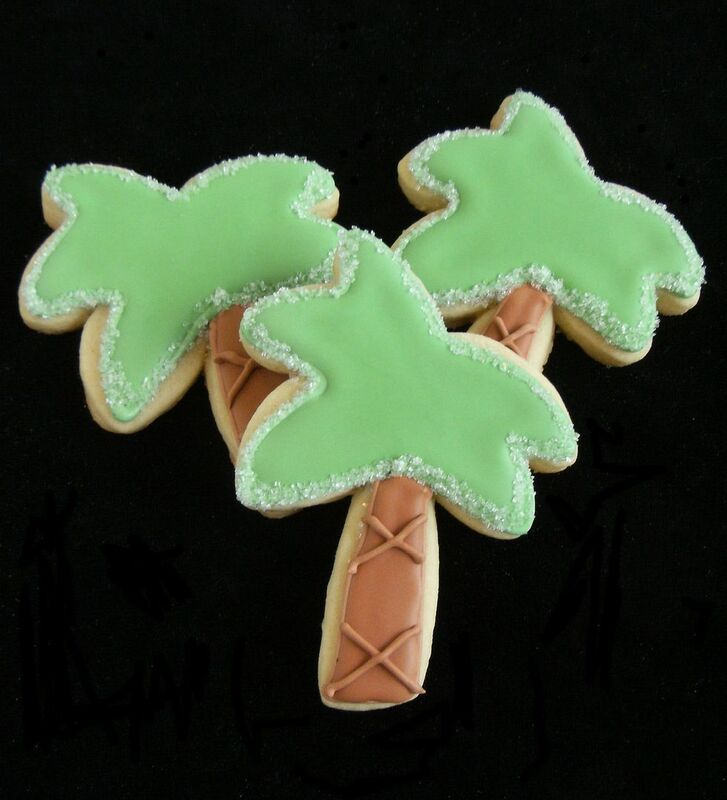 Fantastic looking cookies - I love the little palm trees! 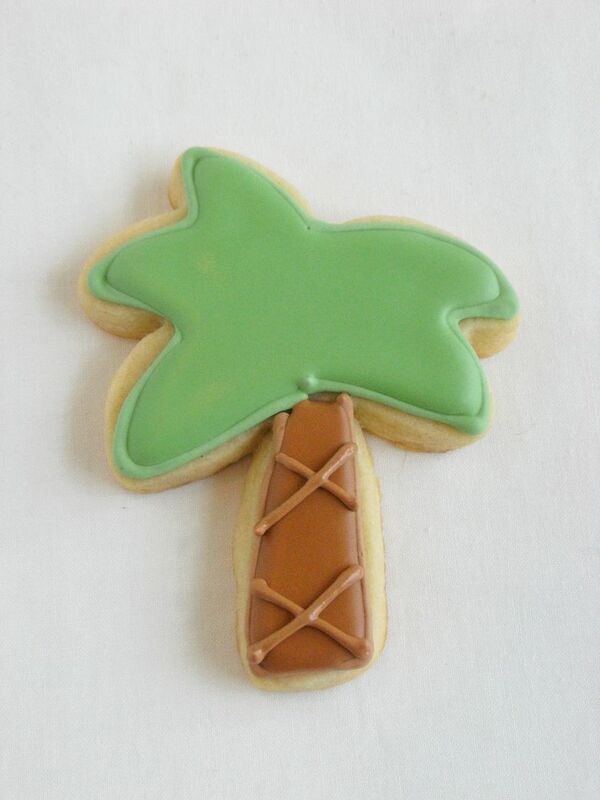 I love the palm tree cookies! 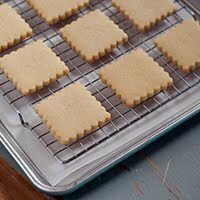 Do you have a cookie cutter for those or do hand cut them? Thanks! I loved the D for D, but bring on the sprinkles!! These look adorable! 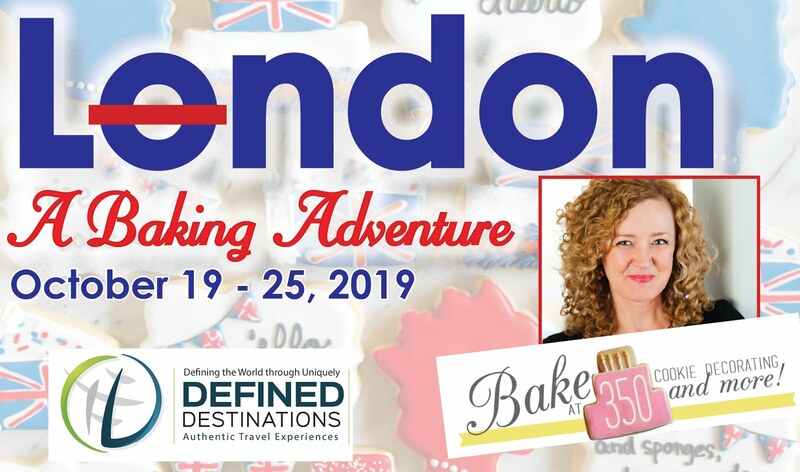 So many great ideas and super looking desserts! Like everything you do Bridget! You are the Queen of CUTE my dear! You never ever ever cease to AMAZE me! I just can't WAIT til THE BOOK! It's just gonna be a dream! Happy Fourth of July Bridget and Family! Can't wait to see what you and Kiddo whip up sweet in the kitchen! So cute! Great theme for the month! Oh my...these are awesome! I was kind of laughing to myself and thinking "I wish my real bathing suit looked like that!" LOVE THEM! Gah! How ridiculously adorable are those? Amazing job on the detail... 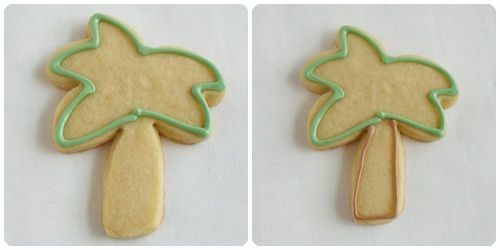 These would be perfect for a beach-themed party, or a party on an actual beach! You and your family have a very happy 4th of July weekend! 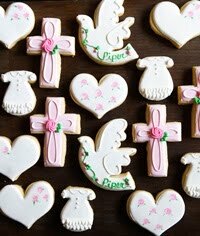 these are by far the most adorable cookies i have seen in a long time! i keep singing that song in my head....she wore an itsy bitsy teeny weenie...yellow polka dot bikini! too cute! bahaha! what a cute idea! love it!